Necessity is truly the mother of invention and such is the case when we set out to make DIY horse feeders out of barrels. What do you need to make DIY horse feeders? For those who follow this blog but didn’t know, in addition to our myriad chickens, we also have horses. 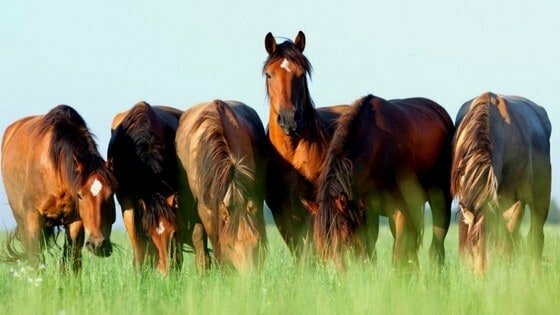 Horses that like to spill their grain and paw at ground feeders until they’ve wasted their meal. Not fun. At least for me, who buys the grain. After years of experimenting with this or that feeder, we finally settled on making our own DIY horse feeders. We needed feeders that couldn’t be knocked over easily, were relatively lightweight, and easy to DIY. I usually do farmwork myself, and let’s face it, I’m a middle aged woman who’s given birth to 2 kids, so I needed something I can easily lift and replace if the DIY horse feeders somehow, magically, find their way to the ground. They also need to be easy to clean, and made of plastic so cleaning was easy. We made these feeders for less than $20, they’re easy to clean and care for, each horse has yet to smash them to smithereens (I’m bitter about past failed purchases, can you tell?). The DIY horse feeders have saved us a LOT on our feed bill because each horse can’t paw and throw their food to kingdom come. They’ve also kept their weight on easier because each horse is consuming ALL their food and not mashing a portion into the ground. Would these DIY horse feeders work for chickens? Possibly, but because of the size, you run the risk of a hen jumping in and pooping on the feed, so a smaller contraption would probably work better. Just my opinion. If you’re looking for an easy, 15 minute solution (yes, each feeder only took about 15 minutes to make) to making your own DIY horse feeders, check out our plans below. You can also buy them online, but a better bet might be to look for restaurants in your area that get food in them but don’t use them once they’re empty. For this DIY project, we used repurposed food-grade 50 gallon barrels. The trick here is to make sure they’re food-grade plastic and have never had anything except food in them. You can tell they’re food grade by the number indicated on the plastic, and the barrels we sourced used to contain coffee. So, they’re safe, not exposed to toxins, and easy to cut. Plastic is necessary because in order to make a place for the horses to stick their head in, you’ll have to cut away part of the plastic. You still need to clean them out even though they’ve only had food in there, so we filled up the entire barrel with water, and added about 1 tablespoon of bleach and allowed it to sit overnight. The next day, we emptied the barrels, cut them (see below), and then scrubbed a final time with water mixed with melaleuca essential oil to fully sanitize them. First, decide how deep you want your DIY feeders. Ours are about 6 inches deep, so we needed to cut away about half the barrel, leaving a 6 inch lip so the feed doesn’t fall out. Using the drill, poke a couple holes in the barrel, then stick the jigsaw in to cut away. You’ll need to also remove part of the top of the barrel. While it might seem logical to keep it on to keep rain, etc out, we found the horses weren’t as willing to stick their heads into the barrel, and if they scare, you’re running the risk of them knocking their heads on the top, or possibly pulling the feeder out of the ground. All in all, the rain hasn’t really made it a huge mess in the feeders since the horses gobble their feed pretty quickly. Since the purpose of the DIY horse feeders is to keep the feed off the ground, you’ll want to fix them to posts. 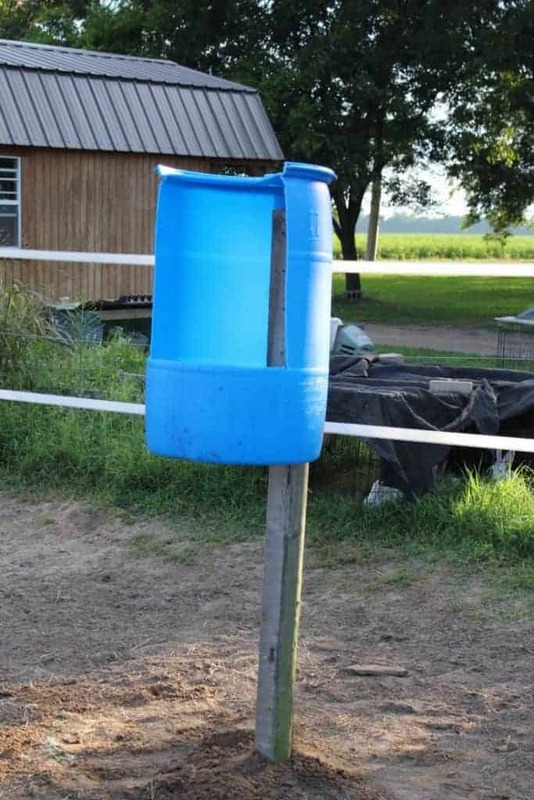 We found the best way to do this (with the least likelihood the horses will pull the barrels off the posts) is to screw the barrels between the post and an additional board. Place your 4-inch screws a couple inches apart to make the connection even sturdier. If you’re handy and have the time, you can place the posts in concrete. However, we wanted to make sure we could move them later if necessary and we didn’t want to mess with concrete. We’ve only had the horses pull the feeders out a couple times. Gas post hole diggers work best, but manual ones work well also and don’t require buying 2 stroke fuel. We made sure each horse has their own DIY horse feeder. Our horses like fighting and bickering with each other, so the separate feeders has made eating time a little quieter. If your horses are more peaceful companions, or they’re smaller, you might be able to get away with 1 feeder per 2 horses.